It's far too lovely a morning to spend sitting inside crouched over a keyboard, either working or playing with my blog. It's warm and sunny and the colour saturation's turned right up. 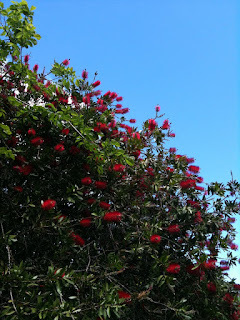 The bottlebrush is in full flower, the opening act for the OTT glories of the pohutukawa next month when the big gnarled trees rise up from puddles of red made by fallen petals. The air was fresh on my walk this morning, tui were swooping low with a rustle of wings, blackbirds singing, doves cooing and for once the tide was in, concealing the mud on our little mangrovey beach, so that was good too. The next few days are meant to be dull and damp again, so today I'll be mowing the lawn, fussing with more pot protectors for my runner beans, and pulling up some weeds in the hen run to expose some fresh soil to get the chickens excited. I'll pick some sweet peas and creep up on the frog. Today I'm not going to write about exotic places I've been: I'm going outside to enjoy where I am.